1) Tweet us @NerdAppropriate with what topics you’d like for us talk about on episode 50. If you don’t like Twitter, then feel free to leave a reply here in the thread. We’re pretty friendly! 2) Guests: Who would you like to see drop by episode 50? Do you have a favorite “nerd” that you’d like to learn more about? We’ll do our best to get them on the show. 3) Rate Us: We don’t ask you all for much, but we’d love if you dropped by iTunes and gave us a review/rating. There are so many podcasts out there, and very few make it all the way to episode 50. We’re proud! 4) Focus: What would you like to see from us in the future? We have some HUGE things coming soon, but we’re very curious about what you’d like to see from the site. Let us know! Join us live from our new “podcast room TM” as we talk about the legendary 2010. I’d like for you guys to talk about your opinions on Kevin Smith’s Comic Book Men for those of you who watched it. Do you feel it accurately describes the ideal comic book store environment? Does it jump way to much from trying to be Pawn Stars to a podcast, to random things like playing hockey or going to a yard sale? Great idea Justin, as always thanks for your input. 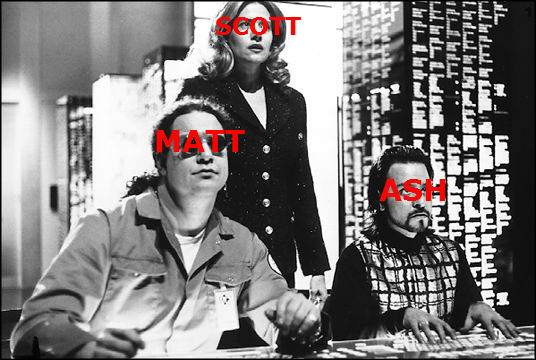 Hey Matt, Ash, and Scott. I’ve had the pleasure of meeting all of you in Orlando, but this is my first post on the site so I wanted to say that I’m a big fan of the podcast. 1. Have your lives changed in any drastic way because of NA? 2. Are there any particular interviews or opportunites you had because of NA that stand out? 3. What were the thoughts of your families and friends at NA’s inception compared to now? 4. Has anything occured because of NA that you never anticipated? I know these are pretty base but it could lead to some intresting discussion. Also, have you guys heard anything new about the upcoming E3? It’s only a few months away and it should be a big one with the confirmations of Sony’s and Microsoft’s next consoles. Thanks so much! These are some great questions that will be a lot of fun to answer. And again, thank you for supporting our site. It means a lot.